For other uses, see Mountain (disambiguation). Mount Ararat, as seen from Armenia. There is no universally accepted definition of a mountain. Elevation, volume, relief, steepness, spacing and continuity have been used as criteria for defining a mountain. In the Oxford English Dictionary a mountain is defined as "a natural elevation of the earth surface rising more or less abruptly from the surrounding level and attaining an altitude which, relatively to the adjacent elevation, is impressive or notable." Whether a landform is called a mountain may depend on local usage. Mount Scott outside Lawton, Oklahoma, USA, is only 251 m (823 ft) from its base to its highest point. Whittow's Dictionary of Physical Geography states "Some authorities regard eminences above 600 metres (2,000 ft) as mountains, those below being referred to as hills." In the United Kingdom and the Republic of Ireland, a mountain is usually defined as any summit at least 2,000 feet (or 610 metres) high, whilst the official UK government's definition of a mountain, for the purposes of access, is a summit of 600 metres or higher. In addition, some definitions also include a topographical prominence requirement, typically 100 or 500 feet (30 or 152 m). At one time the U.S. Board on Geographic Names defined a mountain as being 1,000 feet (300 m) or taller, but has abandoned the definition since the 1970s. Any similar landform lower than this height was considered a hill. However, today, the United States Geological Survey (USGS) concludes that these terms do not have technical definitions in the US. There are three main types of mountains: volcanic, fold, and block. All three types are formed from plate tectonics: when portions of the Earth's crust move, crumple, and dive. Compressional forces, isostatic uplift and intrusion of igneous matter forces surface rock upward, creating a landform higher than the surrounding features. The height of the feature makes it either a hill or, if higher and steeper, a mountain. Major mountains tend to occur in long linear arcs, indicating tectonic plate boundaries and activity. Volcanoes are formed when a plate is pushed below another plate, or at a mid-ocean ridge or hotspot. At a depth of around 100 km, melting occurs in rock above the slab (due to the addition of water), and forms magma that reaches the surface. When the magma reaches the surface, it often builds a volcanic mountain, such as a shield volcano or a stratovolcano. Examples of volcanoes include Mount Fuji in Japan and Mount Pinatubo in the Philippines. The magma does not have to reach the surface in order to create a mountain: magma that solidifies below ground can still form dome mountains, such as Navajo Mountain in the US. Illustration of mountains that developed on a fold that thrusted. Fold mountains occur when two plates collide: shortening occurs along thrust faults and the crust is overthickened. Since the less dense continental crust "floats" on the denser mantle rocks beneath, the weight of any crustal material forced upward to form hills, plateaus or mountains must be balanced by the buoyancy force of a much greater volume forced downward into the mantle. Thus the continental crust is normally much thicker under mountains, compared to lower lying areas. Rock can fold either symmetrically or asymmetrically. The upfolds are anticlines and the downfolds are synclines: in asymmetric folding there may also be recumbent and overturned folds. The Balkan Mountains and the Jura Mountains are examples of fold mountains. Block mountains are caused by faults in the crust: a plane where rocks have moved past each other. When rocks on one side of a fault rise relative to the other, it can form a mountain. The uplifted blocks are block mountains or horsts. The intervening dropped blocks are termed graben: these can be small or form extensive rift valley systems. This form of landscape can be seen in East Africa, the Vosges, the Basin and Range Province of Western North America and the Rhine valley. These areas often occur when the regional stress is extensional and the crust is thinned. The Catskills in Upstate New York represent an eroded plateau. During and following uplift, mountains are subjected to the agents of erosion (water, wind, ice, and gravity) which gradually wear the uplifted area down. Erosion causes the surface of mountains to be younger than the rocks that form the mountains themselves. 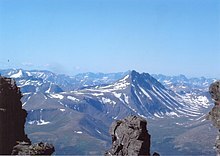 Glacial processes produce characteristic landforms, such as pyramidal peaks, knife-edge arêtes, and bowl-shaped cirques that can contain lakes. Plateau mountains, such as the Catskills, are formed from the erosion of an uplifted plateau. In earth science, erosion is the action of surface processes (such as water flow or wind) that removes soil, rock, or dissolved material from one location on the Earth's crust, and then transport it away to another location (not to be confused with weathering which involves no movement). The particulate breakdown of rock or soil into clastic sediment is referred to as physical or mechanical erosion; this contrasts with chemical erosion, where soil or rock material is removed from an area by its dissolving into a solvent (typically water), followed by the flow away of that solution. Eroded sediment or solutes may be transported just a few millimetres, or for thousands of kilometres. A combination of high latitude and high altitude makes the northern Urals in picture to have climatic conditions that make the ground barren. Climate in the mountains becomes colder at high elevations, due to an interaction between radiation and convection. Sunlight in the visible spectrum hits the ground and heats it. The ground then heats the air at the surface. If radiation were the only way to transfer heat from the ground to space, the greenhouse effect of gases in the atmosphere would keep the ground at roughly 333 K (60 °C; 140 °F), and the temperature would decay exponentially with height. However, when air is hot, it tends to expand, which lowers its density. Thus, hot air tends to rise and transfer heat upward. This is the process of convection. Convection comes to equilibrium when a parcel of air at a given altitude has the same density as its surroundings. Air is a poor conductor of heat, so a parcel of air will rise and fall without exchanging heat. This is known as an adiabatic process, which has a characteristic pressure-temperature dependence. As the pressure gets lower, the temperature decreases. The rate of decrease of temperature with elevation is known as the adiabatic lapse rate, which is approximately 9.8 °C per kilometre (or 5.4 °F per 1000 feet) of altitude. Note that the presence of water in the atmosphere complicates the process of convection. Water vapor contains latent heat of vaporization. As air rises and cools, it eventually becomes saturated and cannot hold its quantity of water vapor. The water vapor condenses (forming clouds), and releases heat, which changes the lapse rate from the dry adiabatic lapse rate to the moist adiabatic lapse rate (5.5 °C per kilometre or 3 °F per 1000 feet) The actual lapse rate can vary by altitude and by location. Therefore, moving up 100 metres on a mountain is roughly equivalent to moving 80 kilometres (45 miles or 0.75° of latitude) towards the nearest pole. This relationship is only approximate, however, since local factors such as proximity to oceans (such as the Arctic Ocean) can drastically modify the climate. As the altitude increases, the main form of precipitation becomes snow and the winds increase. The effect of the climate on the ecology at an elevation can be largely captured through a combination of amount of precipitation, and the biotemperature, as described by Leslie Holdridge in 1947. Biotemperature is the mean temperature; all temperatures below 0 °C (32 °F) are considered to be 0 °C. When the temperature is below 0 °C, plants are dormant, so the exact temperature is unimportant. The peaks of mountains with permanent snow can have a biotemperature below 1.5 °C (34.7 °F). The colder climate on mountains affects the plants and animals residing on mountains. A particular set of plants and animals tend to be adapted to a relatively narrow range of climate. Thus, ecosystems tend to lie along elevation bands of roughly constant climate. This is called altitudinal zonation. In regions with dry climates, the tendency of mountains to have higher precipitation as well as lower temperatures also provides for varying conditions, which enhances zonation. Some plants and animals found in altitudinal zones tend to become isolated since the conditions above and below a particular zone will be inhospitable and thus constrain their movements or dispersal. These isolated ecological systems are known as sky islands. Altitudinal zones tend to follow a typical pattern. At the highest elevations, trees cannot grow, and whatever life may be present will be of the alpine type, resembling tundra. Just below the tree line, one may find subalpine forests of needleleaf trees, which can withstand cold, dry conditions. Below that, montane forests grow. In the temperate portions of the earth, those forests tend to be needleleaf trees, while in the tropics, they can be broadleaf trees growing in a rain forest. 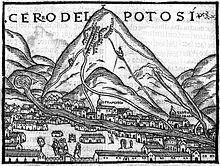 The silver-rich Cerro Rico in Potosí, Bolivia, was in colonial times an immerse source of wealth for the Spanish administration. The highest known permanently tolerable altitude is at 5,950 metres (19,520 ft). At very high altitudes, the decreasing atmospheric pressure means that less oxygen is available for breathing, and there is less protection against solar radiation (UV). Above 8,000 metres (26,000 ft) elevation, there is not enough oxygen to support human life. This is known as the "death zone". The summits of Mount Everest and K2 are in the death zone. Mountains are generally less preferable for human habitation than lowlands, because of harsh weather and little level ground suitable for agriculture. While 7% of the land area of Earth is above 2,500 metres (8,200 ft), only 140 million people live above that altitude and only 20-30 million people above 3,000 metres (9,800 ft) elevation. About half of mountain dwellers live in the Andes, Central Asia, and Africa. With limited access to infrastructure, only a handful of human communities exist above 4,000 metres (13,000 ft) of elevation. Many are small and have heavily specialized economies, often relying on industries such as agriculture, mining, and tourism. An example of such a specialized town is La Rinconada, Peru, a gold-mining town and the highest elevation human habitation at 5,100 metres (16,700 ft). A counterexample is El Alto, Bolivia, at 4,150 metres (13,620 ft), which has a highly diverse service and manufacturing economy and a population of nearly 1 million. Traditional mountain societies rely on agriculture, with higher risk of crop failure than at lower elevations. Minerals often occur in mountains, with mining being an important component of the economics of some montane societies. More recently, tourism supports mountain communities, with some intensive development around attractions such as national parks or ski resorts. About 80% of mountain people live below the poverty line. Most of the world's rivers are fed from mountain sources, with snow acting as a storage mechanism for downstream users. More than half of humanity depends on mountains for water. In geopolitics mountains are often seen as preferable "natural boundaries" between polities. Mountaineering, mountain climbing, or alpinism is the sport, hobby or profession of hiking, skiing, and climbing mountains. 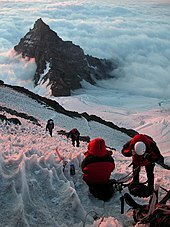 While mountaineering began as attempts to reach the highest point of unclimbed big mountains it has branched into specializations that address different aspects of the mountain and consists of three areas: rock-craft, snow-craft and skiing, depending on whether the route chosen is over rock, snow or ice. All require experience, athletic ability, and technical knowledge to maintain safety. Chimborazo, Ecuador. The point on Earth's surface farthest from its centre. Heights of mountains are typically measured above sea level. Using this metric, Mount Everest is the highest mountain on Earth, at 8,848 metres (29,029 ft). There are at least 100 mountains with heights of over 7,200 metres (23,622 ft) above sea level, all of which are located in central and southern Asia. The highest mountains above sea level are generally not the highest above the surrounding terrain. There is no precise definition of surrounding base, but Denali, Mount Kilimanjaro and Nanga Parbat are possible candidates for the tallest mountain on land by this measure. The bases of mountain islands are below sea level, and given this consideration Mauna Kea (4,207 m (13,802 ft) above sea level) is the world's tallest mountain and volcano, rising about 10,203 m (33,474 ft) from the Pacific Ocean floor. The highest mountains are not generally the most voluminous. Mauna Loa (4,169 m or 13,678 ft) is the largest mountain on Earth in terms of base area (about 2,000 sq mi or 5,200 km2) and volume (about 18,000 cu mi or 75,000 km3). Mount Kilimanjaro is the largest non-shield volcano in terms of both base area (245 sq mi or 635 km2) and volume (1,150 cu mi or 4,793 km3). Mount Logan is the largest non-volcanic mountain in base area (120 sq mi or 311 km2). The highest mountains above sea level are also not those with peaks farthest from the centre of the Earth, because the figure of the Earth is not spherical. Sea level closer to the equator is several miles farther from the centre of the Earth. The summit of Chimborazo, Ecuador's tallest mountain, is usually considered to be the farthest point from the Earth's centre, although the southern summit of Peru's tallest mountain, Huascarán, is another contender. Both have elevations above sea level more than 2 kilometres (6,600 ft) less than that of Everest. ^ a b c Gerrard 1990. ^ Whittow, John (1984). Dictionary of Physical Geography. London: Penguin. p. 352. ISBN 0-14-051094-X. ^ Nuttall, John & Anne (2008). England. The Mountains of England & Wales. 2 (3rd ed.). Milnthorpe, Cumbria: Cicerone. ISBN 1-85284-037-4. - "Survey turns hill into a mountain". BBC News. Archived from the original on 2 October 2013. Retrieved 3 February 2013. - "A Mountain is a Mountain – isn't it?". www.go4awalk.com. Archived from the original on 8 February 2013. Retrieved 3 February 2013. - "mountain". dictionary.reference.com. Archived from the original on 5 February 2013. Retrieved 3 February 2013. - Wilson, Peter (2001). "Listing the Irish hills and mountains" (PDF). Irish Geography. Coleraine: University of Ulster. 34 (1): 89. doi:10.1080/00750770109555778. Archived from the original (PDF) on 27 June 2013. ^ "What is a "Mountain"? Mynydd Graig Goch and all that..." Metric Views. Archived from the original on 30 March 2013. Retrieved 3 February 2013. ^ "What is the difference between "mountain", "hill", and "peak"; "lake" and "pond"; or "river" and "creek?"". US Geological Survey. US Geological Survey. ^ "What is the difference between lake and pond; mountain and hill; or river and creek?". USGS. Archived from the original on 12 February 2013. Retrieved 11 February 2013. ^ Blyth et al. 2002, p. 74. ^ a b Blyth et al. 2002, p. 14. ^ a b c Panos (2002). "High Stakes" (PDF). Archived (PDF) from the original on 3 June 2012. Retrieved 17 February 2009. ^ "Chapter 6: Mountain building". Science matters: earth and beyond; module 4. Pearson South Africa. 2002. p. 75. ISBN 0-7986-6059-7. Archived from the original on 9 May 2016. ^ Butz, Stephen D (2004). "Chapter 8: Plate tectonics". Science of Earth Systems. Thompson/Delmar Learning. p. 136. ISBN 0-7668-3391-7. Archived from the original on 7 May 2016. ^ Gerrard 1990, p. 194. ^ Searle, Michael P (2007). "Diagnostic features and processes in the construction and evolution of Oman-, Zagros-, Himalayan-, Karakoram-, and Tibetan type orogenic belts". In Robert D. Hatcher Jr.; MP Carlson; JH McBride; JR Martinez Catalán. 4-D framework of continental crust. Geological Society of America. pp. 41 ff. ISBN 0-8137-1200-9. Archived from the original on 24 June 2016. ^ Press, Frank; Siever, Raymond (1985). Earth (4th ed.). W.H. Freeman. p. 413. ISBN 978-0-7167-1743-0. ^ Ryan, Scott (2006). "Figure 13-1". CliffsQuickReview Earth Science. Wiley. ISBN 0-471-78937-2. Archived from the original on 30 April 2016. ^ Fraknoi, Morrison & Wolff 2004, p. 160. ^ a b Goody, Richard M.; Walker, James C.G. (1972). "Atmospheric Temperatures" (PDF). Atmospheres. Prentice-Hall. Archived (PDF) from the original on 29 July 2016. ^ "Dry Adiabatic Lapse Rate". tpub.com. Archived from the original on 3 June 2016. Retrieved 2 May 2016. ^ Blyth et al. 2002, p. 15. ^ "Factors affecting climate". The United Kingdom Environmental Change Network. Archived from the original on 16 July 2011. ^ Blyth et al. 2002, p. 12. ^ Lugo, Ariel E.; Brown, Sandra L.; Dodson, Rusty; Smith, Tom S.; Shugart, Hank H. (1999). "The Holdridge Life Zones of the conterminous United States in relation to ecosystem mapping". Journal of Biogeography. 26 (5): 1025–1038. doi:10.1046/j.1365-2699.1999.00329.x. Archived from the original on 2013-02-12. ^ Daubenmire, R.F. (June 1943). "Vegetational Zonation in the Rocky Mountains". Botanical Review. 9 (6): 325–393. doi:10.1007/BF02872481. ^ a b Blyth et al. 2002. ^ a b "Biotic Communities of the Colorado Plateau: C. Hart Merriam and the Life Zones Concept". Archived from the original on 4 February 2013. Retrieved 30 January 2010. ^ Tweit, Susan J. (1992). The Great Southwest Nature Factbook. Alaska Northwest Books. pp. 209–210. ISBN 0-88240-434-2. ^ "Tree". Microsoft Encarta Reference Library 2003. Microsoft Corporation. 2002 . 60210-442-1635445-74407. ^ West, JB (2002). "Highest permanent human habitation". High Altitude Medical Biology. 3 (4): 401–407. doi:10.1089/15270290260512882. PMID 12631426. ^ "Everest:The Death Zone". Nova. PBS. 24 February 1998. Archived from the original on 18 June 2017. ^ Moore, Lorna G. (2001). "Human Genetic Adaptation to High Altitude". High Alt Med Biol. 2 (2): 257–279. doi:10.1089/152702901750265341. PMID 11443005. ^ Cook, James D.; Boy, Erick; Flowers, Carol; del Carmen Daroca, Maria (2005). "The influence of high-altitude living on body iron". Blood. 106 (4): 1441–1446. doi:10.1182/blood-2004-12-4782. PMID 15870179. ^ Finnegan, William (20 April 2015). "Tears of the Sun". The New Yorker. ^ "El Alto, Bolivia: A New World Out Of Differences". Archived from the original on 16 May 2015. ^ Blyth et al. 2002, p. 17. ^ Blyth et al. 2002, p. 22. ^ "International Year of Freshwater 2003". Archived from the original on 7 October 2006. Retrieved 7 December 2006. - "The Mountain Institute". Archived from the original on 9 July 2006. Retrieved 7 December 2006. ^ Kolossov, V. (2005). Border studies: changing perspectives and theoretical approaches. Geopolitics, 10(4), 606-632. - Van Houtum, H. (2005). The geopolitics of borders and boundaries. Geopolitics, 10(4), 672-679. ^ Cox, Steven M.; Fulsaas, Kris, eds. (2009) . Mountaineering: The Freedom of the Hills (7 ed.). Seattle: The Mountaineers. ISBN 0-89886-828-9. ^ "The 'Highest' Spot on Earth". Npr.org. 7 April 2007. Archived from the original on 10 February 2013. Retrieved 31 July 2012. ^ "Nepal and China agree on Mount Everest's height". BBC News. 8 April 2010. Archived from the original on 3 March 2012. Retrieved 22 August 2010. ^ Helman, Adam (2005). The Finest Peaks: Prominence and Other Mountain Measures. Trafford. p. 9. ISBN 1-4122-3664-9. the base to peak rise of Denali is the largest of any mountain that lies entirely above sea level, some 18,000 feet. ^ "Mountains: Highest Points on Earth". National Geographic Society. Archived from the original on 3 July 2010. Retrieved 19 September 2010. ^ Kaye, G.D. (2002). "Using GIS to estimate the total volume of Mauna Loa Volcano, Hawaii". 98th Annual Meeting. Geological Society of America. Archived from the original on 25 January 2009. ^ Krulwich, Robert (7 April 2007). "The 'Highest' Spot on Earth?". Archived from the original on 10 February 2013. Retrieved 21 March 2009. Blyth, S.; Groombridge, B.; Lysenko, I.; Miles, L.; Newton, A. (2002). "Mountain Watch" (PDF). UNEP World Conservation Monitoring Centre, Cambridge, UK. Archived from the original (PDF) on 11 May 2008. Retrieved 17 February 2009. Fraknoi, A.; Morrison, D.; Wolff, S. (2004). Voyages to the Planets (3rd ed.). Belmont: Thomson Books/Cole. ISBN 978-0-534-39567-4. Gerrard, A.J. (1990). Mountain Environments: An Examination of the Physical Geography of Mountains. Cambridge, Massachusetts: MIT Press. ISBN 978-0-262-07128-4. Wikimedia Commons has media related to Mountain. "Mountain" . Encyclopædia Britannica. 18 (11th ed.). 1911. This page was last edited on 16 April 2019, at 17:46 (UTC).